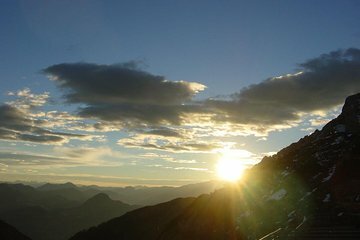 The sound of music permeates Salzburg, a charming city of more than 145,000 inhabitans in western Austria. 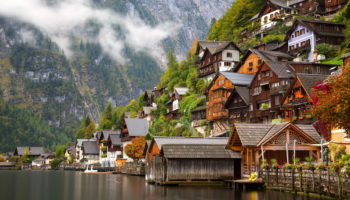 The city on the Salzach River is famous for the setting for that endearing musical, The Sound of Music. 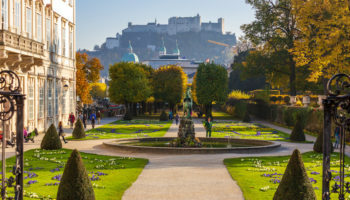 But long before the Rodgers and Hammerstein blockbuster, Salzburg was well-known for the birthplace of Mozart, one of the world’s great classical music composers. 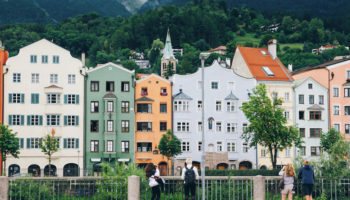 It’s possible to see a few of the attractions in Salzburg on a quick day trip from Munich or Vienna, but spending a few days allows visitors to take in more sights and soak in the atmosphere of this delightful city. Travelers with an interest in pre-historic sites may enjoy a visit to Kapuzinerberg. Sitting on a hill overlooking the Salzach River, human habitation of Kapuzinerberg dates back to the Neolithic period. The hill is not fully developed, and small wild animals may be seen roaming the gardens and grounds. Kapuzinerberg is best known for its Way of the Cross chapels that tell the story of the Passion of Christ as they lead up the hill. The route ends with an impressive depiction of the crucifixion. A monastery, towers from an old fortress and lush gardens add to the site’s beauty. Petersfriedhof, or St Peter’s Cemetery, is the oldest Christian cemetery in Austria, in its present condition dating back to 1627. It is the final resting place of Salzburg’s aristocrats, with families still tending their graves today, adorning them with flowers, most notably pansies. Other notables buried here include Mozart’s sister and Joseph Hayden’s younger brother. Catacombs above the cemetery contain altars, murals and other rooms that are open to public view. 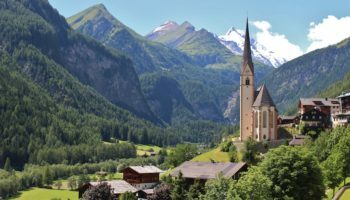 The cemetery’s biggest draw, however, comes from visitors who want to see where the Von Trapp family hid while escaping from the Nazis in The Sound of Music. Getreidegasse, which translates as Grain Lane, is Salzburg’s most famous shopping street. 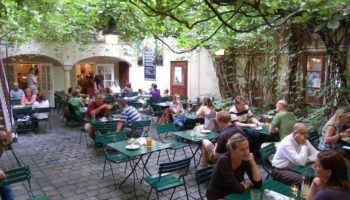 Located in Old Town, Getreidegasse is filled with high narrow buildings that contain shops, boutiques and restaurants serving the city’s specialties, including mouthwatering desserts. Some buildings have guild signs that indicate the type of work that took place here in centuries past. Jewelry and traditional costumes are among the popular items on shoppers’ lists. Note that No. 9 Getreidegasse is where Mozart was born. Visitors should take time to explore the passageways and courtyards off this street as there are even more enticing shops to separate visitors from their Euros. Owned by Red Bull founder Dietrich Mateschitz, Hangar 7 is a stylish, hangar-inspired museum with a collection of historical airplanes, helicopters and Formula One racing cars. It is one of those museums that is just as intriguing from the outside as it is from the inside. The wing-like dome of the museum and adjoining cylindrical towers are built of a latticework of steel supporting a glass shell. The sleek, modern structure contrasts sharply with the Alps rising in the backdrop. Hangar 7 is also home to the Michelin starred restaurant Ikarus as well as two bars and a lounge. No. 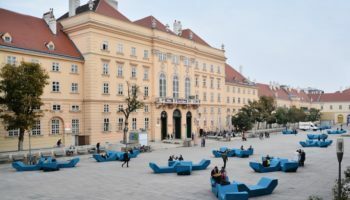 9 Getreidegasse is home to one of the most visited museums in Austria. It is here that Wolfgang Amadeus Mozart was born on January 27, 1756. The museum that honors the life of this great composer is spread out over three floors. The first floor concentrates on his everyday life, with utensils, original documents and paintings. The second floor is dedicated to his life as a composer of operas, with costumes and sets. The third floor contains the room where Mozart was born and also tells about his family members. Residenzplatz, or Residence Square, is located in the heart of Old Town Salzburg, This magnificent square is surrounded by archbishop residences, Salzburg Cathedral, the Old Residence and townhouses now filled with shops and eateries. It is also the place where visitors can hop a horse0drawn carriage for a ride through the streets of Old Town. A fountain, said to be Salzburg’s most beautiful, punctuates the square. This unique fountain sports snorting horses, giants and dolphins. Many public events, including Salzburg’s Christmas fair, take place in the square today. Visitors to Hellbrunn Palace should wear clothes that dry quickly. That’s because the trick fountains the palace is famous for spray water on visitors. One of the most famous family attractions in Salzburg, this early 17th century Renaissance palace was originally built as a pleasurable place where archbishops could relax for a day. Since they came only for a day, the palace has no bedrooms, though it was intended as a summer residence. Sound of Music fans may recognize the pavilion where Liesl sang “Sixteen Going on Seventeen” to Rolfe, though it was located at another palace when the movie was filmed. Salzburger Dom, also known as Salzburg Cathedral, dates back to the eighth century. The imposing Italian Baroque cathedral as it exists today was built in the 17th century. The cathedral, which was bombed in World War II, is dedicated to its early founders, St. Rupert and St. Virgilius. Located on the Dopmplatz, the front of the cathedral is dominated by a column with a statue of the Virgin Mary at the top. Four figures below her represent the angels, wisdom, evil and the church. The church’s interior contains the font where Mozart was baptized. Mirabell Palace was built in 1606 by a prince-archbishop who intended it as a home for his mistress. It was later rebuilt in Baroque and Neoclassical styles, and served as the 1815 birthplace of the future King Otto of Greece. 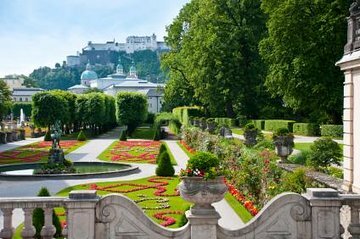 The building’s front is plain compared to other Salzburg palaces, but visitors will find lush gardens, featuring statues of mythological people, on the grounds. Maria and the Von Trapp children sang “Do Re Mi” here in Sound of Music. The palace is a popular spot for weddings, including the World War II marriage of Eva Braun’s sister to one of Adolph Hitler’s staff officers; Hitler was a witness. Sitting stop Festungsberg hill, Hohensalzburg Castle is Salzburg’s most famous landmark. Built in 1077, Hohensalzburg Castle is one of the largest and best preserved fortresses today in Central Europe. The fortress is so soundly built, it has never been conquered. 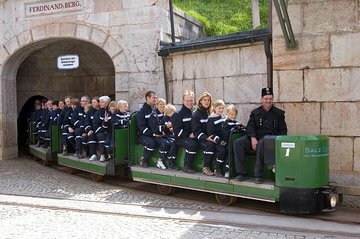 Once housing a military barracks and prison, the fortress today is a multi-purpose facility. With medieval rooms and courtyards open to the public, Hohensalzburg Castle also houses an International Summer Academy and concerts.